A Wraith hive ship detected on approach to Atlantis a few weeks ago (“Inferno”) arrives and radios a message. The Wraith address Dr. Elizabeth Weir by name. 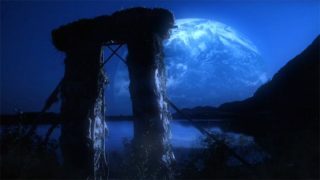 She concludes that Michael is on board and has informed these Wraith that Atlantis is still intact on the planet (“Michael”), as the Wraith have believed for months that the city was destroyed (“The Siege, Part 3”). Michael is a Wraith that Weir’s people recently captured as a test subject, using Dr. Carson Beckett’s retrovirus to transform him into a human. Weir’s response is routed through the Daedalus to disguise exactly where the city is located. Michael, transformed more back to his Wraith appearance, appears on the monitor. He informs her that because the Wraith woke up too soon, there are too few humans to feed upon. And since they can’t find Earth, the perfect new feeding ground they hoped for, the Wraith now have a civil war on their hands. Michael proposes an alliance to turn enemy Wraith into humans using the retrovirus; then they will feed on their Wraith enemies, and not on humans. And they will also share the secrets of Wraith ships and technology in exchange. Dr. Weir decides that with the Daedalus and the Orion (a recently discovered Ancient warship) on hand, plus a new supply of Ancient drone weapons, the city can repel one lone hive ship. But she is suspicious. As a sign of good faith, Michael sends a data burst detailing the Wraith jamming codes established before the war — information that will allow the Daedalus to defeat enemy counter-measures and beam nukes onto target ships (“The Siege, Part 3”). He warns them not to try to destroy his ship or he will alert all the other Wraith to Atlantis’s continued existence. After conferring with Sheppard’s team and Colonel Steven Caldwell, Weir decides to work with these Wraith. Teyla is very apprehensive, believing the Wraith are treacherous. The Wraith Queen and her lieutenants come down to the city to begin tests on the retrovirus. Working with a Wraith scientist, Drs. Beckett and Radek Zelenka discuss the problems of disseminating the retrovirus using aerosol gas or explosive pheromone delivery systems. Currently, the scientists do not know how long it will take to work once it reaches the necessary systems. If it isn’t done quickly, the affected ship will open fire on Michael’s ship when they use it. The Wraith Queen explains that, if they are successful, a balance will be established for many generations between the humans and the Wraith of the Pegasus Galaxy. By feeding on other Wraith, they will diminish their own numbers. Hence, the humans of the galaxy will know peace for a long time. But, she wants a demonstration. The retrovirus is tested on one of her own men, and he transforms into a human. The Queen mercilessly feeds on him and declares the test a success. Beckett is wracked with guilt and the others are appalled. Certainly their plan does not come without its ethical dilemmas. The Queen wants to next test the weapon on an enemy ship, under the pretense of negotiating her own surrender. McKay must devise a system for synchronized release of multiple canisters, which will be planted throughout the ship. Weir demands that her own people observe the attack to make sure the Queen sticks with the plan. But Sheppard and Caldwell worry that the whole attack is premature. As they feared, the mission is a failure and the hive ships open fire on each other. The so-called friendly Wraith ship takes serious damage, so the Daedalus enters the battle to defend it. Michael’s ship makes a hyperspace jump to safety. Back in the city, the Queen angrily demands a better delivery system since her delegation was searched and destroyed before they could place the canisters. In Atlantis, the McKay and the Asgard Hermiod break the Wraith jamming codes by trial and error. Thinking that he is calling the Queen’s bluff, McKay demands all the specifications of a hive ship in order to make an effective delivery system. Much to his surprise the Queen quickly complies, sending all specifications for virtually all Wraith technology. McKay examines the data and discovers that the ships are of organic construction and can heal themselves, for the most part. Repair crews known as Keepers are no longer available, having made their own alliances during the civil war. So, McKay and Ronon go to the hive ship to take readings. Rodney determines that the CO2 scrubbers are the most effective spot to release the gas; one big canister should do it. So McKay and Sheppard propose flying the Daedalus in the shadow of the larger hive ship to fool the enemy sensors. If they can get close enough to another enemy hive, they can now beam in the gas canister. McKay volunteers to observe in order to continue hacking into the Wraith systems. He has programmed a remote transport device, which he can use to beam out at the first sign of trouble. When the Daedalus exits hyperspace at the given coordinates, two Wraith ships are lying in wait and begin to attack. In the battle, Caldwell can’t get close enough to get McKay and Ronon off the Wraith ship — and McKay’s devices don’t work as promised. He and Ronon are taken prisoner. Sheppard tries to disable the Wraith ship using an F-302 fighter craft, while Hermiod discovers the jamming codes have not been broken after all — so he cannot beam over a nuke. The hive ships jump to hyperspace. Sheppard’s fighter is nowhere to be found. 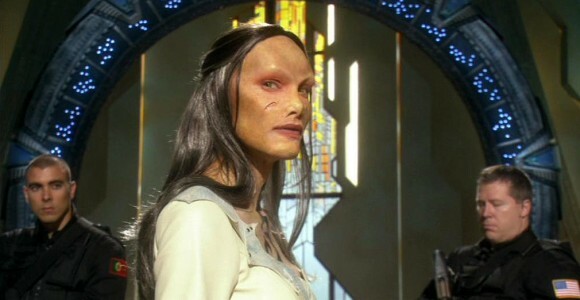 Back in Atlantis, Zelenka discovers that a computer virus has deleted all the data provided by the Wraith. Worse, it data-mined Atlantis computers and transmitted two things to the enemy: the “Aurora” mission reports and the coordinates of every world in their database. As a result, McKay and Ronon are on the hive ship now on a course for Earth. The Wraith are fighting a civil war, which some (including this Queen) believe may go on for centuries. When Michael reported back to the Wraith, he informed this cell of the retrovirus used to temporarily transform him into a human (“Michael”). The Wraith then launched a plan to use the retrovirus on their fellow Wraith, to give them a strategic advantage and end the war quickly. The war is apparently being fought over resources. Usually the entire Wraith society in the Pegasus Galaxy is not all awake at the same time. But when John Sheppard killed the Wraith Keeper, that action triggered a system that prematurely woke up all Wraith everywhere. Michael implied that the Keeper may have awoken the Wraith deliberately, having learned of the existence of Earth from Colonel Marshall Sumner — a rich new feeding ground will billions of humans. But the Wraith have not been able to find Earth, let alone get there. Now they have limited resources to sustain them — most notably, humans for food. For the first time in the history of their race, there are not enough humans to sustain them all. This had lead to their present conflict, with different queens commanding their own hives and forming alliances with one another. Atlantis has been given the jamming codes used by Wraith hive ships to prevent transport beams from accessing their ships. This strategy was used to transport explosive devices onto hive ships in a previous conflict, using Asgard transporter technology on board the Daedalus (“The Siege, Part 3”). Presumably, since the Wraith betrayed the alliance, they have the ability to adapt their jamming technology to render this new advantage useless. The Wraith have given Atlantis access to their database — “everything you ever wanted to know about Wraith technology but were afraid to ask” — short-term, at least. Though the database self-destructed when the Wraith betrayed the alliance, McKay and the base’s scientists did get to look it over for several hours. What they learned may yet prove a strategic advantage. The Wraith Queen held out a very tempting element to the alliance: if they were allowed to feed on their enemy Wraith, it would significantly diminish the Wraith population and “restore balance” to the galaxy. The Wraith would no longer pose the widespread, systemic threat that they posed even to the Lanteans when they defeated them 10,000 years ago. Philosophically, the Wraith — or at least some, including this Queen — have no qualms about feeding on their own people. The retrovirus makes that possible, stripping out the iratus bug DNA and leaving only the human behind. It took two dead-on shots from a Wraith stunner rifle to take down Ronon. The Wraith broke the alliance even without having possession of any of the retrovirus in their possession. Clearly they are not concerned about it, and have no intention of using it on their own kind. Instead, their ultimate plan was to hack the Atlantis database and find the location of Earth — and the means to upgrade their hyperdrive to reach it. The Wraith used their computer virus to steal only two pieces of information from Atlantis: the Aurora mission reports, and the location of every world in their database. This includes Earth, which is where the two hive ships are now headed. How can they get there, seeing as how Wraith hyperdrive technology cannot cross the vast distance between galaxies in a reasonable amount of time? The key is in the Aurora mission reports. Sheppard and his team discovered an Ancient warship, with the entire crew asleep in stasis. Presumably there is sufficient information in the report to allow them to upgrade their hyperdrive technology to cross the intergalactic divide much more quickly. The Wraith did not necessarily have prior knowledge of the Aurora incident. It is more likely that the computer worm was programmed to seek out the relevant hyperdrive data wherever it could be found in the city’s database. Even if the two Wraith hives now en route to Earth can be destroyed, it is possible that the Wraith have already shared its location with other Wraith. It is also possible that they have disclosed the fact that Atlantis is still intact. The Wraith experimented with gas weapons long ago, but found them difficult to use in outer atmosphere combat. The weapons caused explosive decompression in a targeted section. Because of their organic technology, Wraith hive ships have a number of external weaknesses that Dr. Zelenka has already determined. Before the civil war there were Wraith Keepers who maintained the entire fleet — like the one the team encountered soon after its arrival in the Pegasus Galaxy (“Rising, Part 2”). The Wraith have confirmed that there are more than one of them, and that like other Wraith they have made their own alliances. Rodney has hacked a number of the Wraith’s systems under the guise of repairing them. This may prove useful in the future. Ronon Dex – Ronon was forced to work side-by-side with the Wraith, his worst enemy. But because the end goal meant the death of many, many Wraith, he actually endorsed the idea of the alliance. Ronon also came face-to-face with Michael again, and nearly blew his head off. He is clearly looking for a showdown with this particular Wraith. Now, Ronon has been captured by the duplicitous enemy. Rodney McKay – It was the chance of a lifetime for McKay to get to study the secrets of Wraith technology, short-lived as it was. Now he has been captured by the Wraith and is being held in a stasis pod — perhaps to be used later for his technical skills, perhaps to be consumed for food on the journey to Earth. Did McKay and Atlantis’s scientists learn anything of persistent value from their short time with the Wraith database? Will there be any long-term effects to the Atlantis computer system from the Wraith computer virus? Will the Wraith be able to reach Earth? Do the Aurora mission reports have sufficient information to help them upgrade their hyperdrive? Will Ronon and McKay escape from their Wraith captors? What happened to Colonel Sheppard? Is he with the hive ship? VOTE! How would you rate Atlantis's "Allies?"